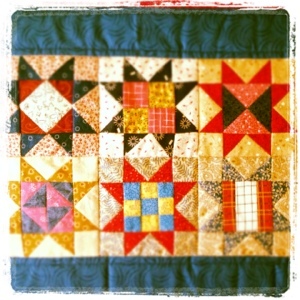 My cute little stars from Temecula Quilt Co. are all put together and quilted. Now I'm taking off the binding because it doesn't look good but I have no idea what to use! Hmmmmm. Love how your stars look together! Very, very sweet. Too bad about your binding though--so frustrating! I know, you would think it would be no big deal, but on a quilt so small, it makes such a difference! I don't know what to use, so I'm just going to let it simmer for a while. If you have scraps of the material you used in the body of the quilt, why not put them together to create a scrappy binding? I really like the way they look on quilts. Oh that's a great idea! I never thought to do it on such a small quilt, but it might be just what it needs! Thank you so much for the suggestion!